Today, I made another thank you card with a great flower stamp from Penny Black. I stamped it twice and fussy cut only the flowers to make a 2D effect. 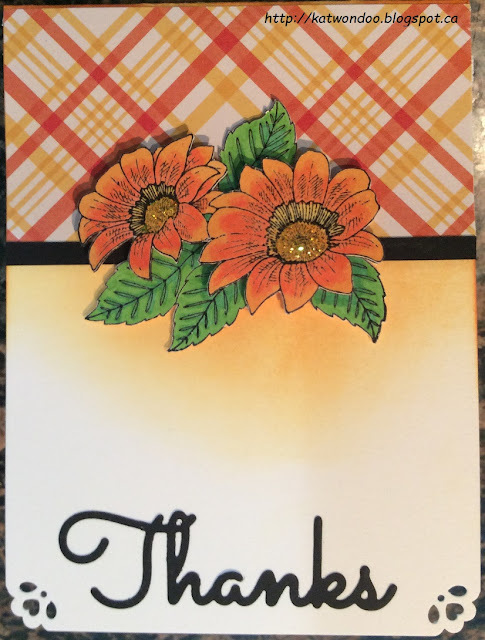 My background was white and I sponged some orange ink, added a patterned paper and a black cardstock to make a separation. In the middle of my flowers I added some yellow stickles. I punched the two bottom corners and added my sentiment, which is a die cut. Beautiful card. I love the sponging of ink below the flower cluster. Great idea. Highlights the flower cluster. Thank you so much for joining in Simon Says Stamp Anything Goes Challenge.